My grandmother was a pastor’s wife for over 50 years as my grandfather pastored 3 churches and served as interim pastor in 13 churches. She was truly the first lady of the church. I remembering her greeting each person at church with grace and dignity. To this day, she still leads Bible studies for women, carrying on the work of ministry long after my grandpa’s passing. My mother was a pastor’s wife for 20 years in three churches. I remember how she would mentor women in the church and community. She loved caring for the elderly women in the church. Now, even though she’s no longer a pastor’s wife, she uses her loving spirit to care for the needs of others. These women are my heroes. Because of them, I have a soft spot in my heart for all pastors’ wives. As a tribute to these great women, I want to share some thoughts that could help your church minister to your pastor’s wife. Each pastor’s wife is unique. The stereotypical pastor’s wife is pretty, nicely dressed, nearly perfect, wise, musical, serves in the nursery, cleans the church, keeps a perfect home, and has a perfect marriage. 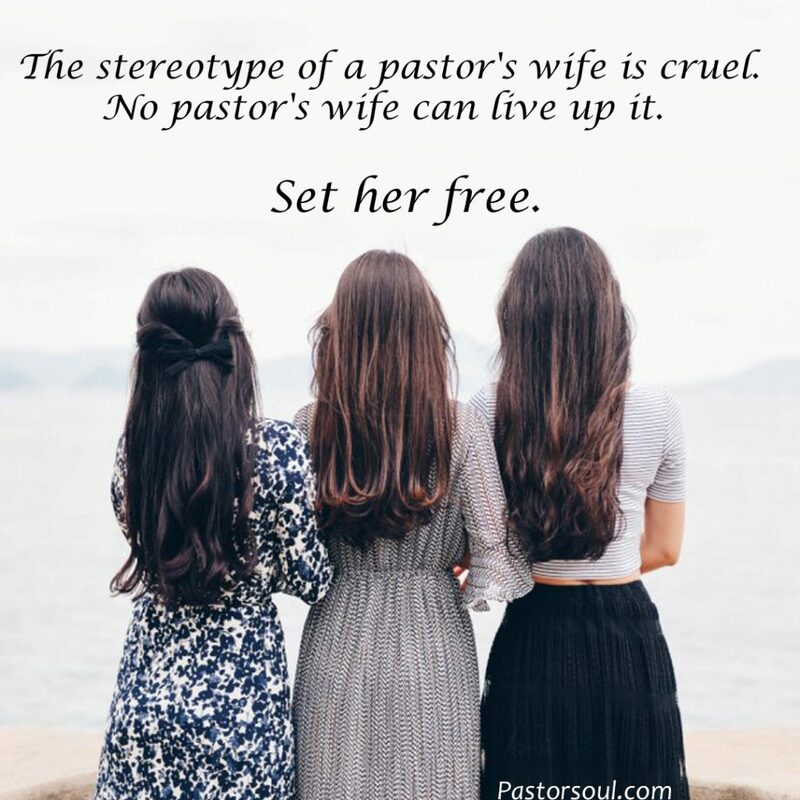 Here’s the truth – this stereotype is cruel and no pastor’s wife can live up to the expectations she feels because of it. Your pastor’s wife is a unique person. Her personality, spiritual gifts, and relationship with God will be different from every other pastor’s wife. Don’t expect her to be anything other than the person God created her to be. How does your pastor’s wife understand her calling from God? Does she see being a pastor’s wife as a role to fulfill or a description of her relationship with her husband? What are her spiritual gifts and natural talents? What does she desire to do in the church? Are your expectations of her shaped by what she says of herself or by your desires for her? Are you appreciating her for who she is as a unique creation of God? The primary ministry of a pastor’s wife is only seen by the pastor. Many pastors’ wives serve in the church. My wife makes the bulletin, leads our mission team, serves in the nursery, leads worship, cleans the church when others forget to, and much more. If she did none of these things, her ministry to the church would still be valuable and extremely hard. The primary ministry of the pastor’s wife is to be a support and help to her husband. She helps him bear the burdens of disappointment, criticism, personal attack, and unrealistic expectations that are present in every church. She sees the dark underbelly of the church but often can’t talk to anyone about it (except other pastors’ wives). As I talk with these women, I find that many of them are hurting deeply. They are emotionally battered by the church and they come back for more each week. I marvel at their strength, their restraint, and their faith in God. I wonder, who is ministering to their unique needs? Where can they go to find healing? The pastor’s wife is not your sounding board for issues with the pastor. Sometimes people have issues with their pastor and rather than talking to him, they find it easier to talk to his wife. We have a word for people like this: cowards. When people criticize a pastor to his wife, they wound her deeply. Many times she won’t speak up about how angry, hurt, or confused this makes her. She should say, “You’ll have to talk to my husband about that and please don’t come to me with problems like this again.” That would be a wise and biblical response. However, many don’t want to cause more trouble for their husbands so they remain silent. If they aren’t careful, their souls can become angry and bitter as they bite their tongue. If you have issues with your pastor there is only one person you should talk to: your pastor. Don’t go to his wife. Don’t talk to a board member. Talk to him first. This shows respect, helps you grow in your ability to address conflict, and follows the teaching of Jesus (see Matthew 18). When you don’t talk to your pastor, you hurt your church and stunt your own spiritual growth. The pastor’s wife doesn’t know everything that goes on in the church. I don’t always tell my wife everything that happens in the church (and sometimes I’m the last to know). There are times when I protect her spirit by not telling her about hurtful statements or painful actions made by people in the church. She isn’t involved in these situations and doesn’t need to bear extra burdens. She doesn’t need to know about all the ministries and activities of the church either. She isn’t charged with the work of overseeing the church. That work belongs to the pastors and elders. She should only be expected to know the same things that everyone else in the church needs to know. Treat her just like another member of the congregation. Even though she might have more information, don’t ask her unless it’s something she’s directly involved in. It’s exhausting for a pastor’s wife to feel like she’s expected to have an answer for everything that happens in the church. Your pastor’s wife needs friends too. Pastors and their wives are often treated as if they aren’t normal human beings. They are put into a special category that makes people keep their distance, but this is ridiculous. Your pastor’s wife is just like you – she has hurts, she sins, she struggles in her walk with God, she has difficulty in her marriage, she has stress from work, etc. Most of all, she needs friends. She needs people who are safe, non-judgmental, and who will love her just as she is. If your pastor’s wife were to share about struggles in her life or marriage, how would you respond? Would your response be different than for other women? Or would you love her in the same way as others? Can she trust that you won’t tell others what she says? Will you hear and feel her pain without offering advice (unless asked)? If you were to go out for a fun night with your pastor’s wife, would she be expected to act differently than everyone else? One of the most beautiful gifts you can give your pastor’s wife is to be a true friend. It may be hard for her to trust you because many pastors’ wives have been burned by people before. However, if you are willing to work past that barrier to truly earn and safeguard her trust, you will be giving her a truly precious gift – the gift of love. Leave a comment below honoring your pastor’s wife. What is one way that you can show her genuine love and support? Spot on. Well said and very important! When I met people outside of the church, I often kept my husband’s profession secret (a pastor) because i wanted people to get to know me before finding out that fact. If they learned early in a relationship, I could see a shift in how they treated me or acted around me. Thanks for sharing! This is an issue that contributes to the loneliness that ministry couples feel.